On July 26, 2016, Serbian National Internet Domain Registry (RNIDS) started implementing a new domain name registration system affecting all registrants of Serbian top-level domains, the Latin .rs and Cyrillic .срб (srb). The new system is in line with the protocol used for registering and verifying generic domains (.com, .net and others). New regulations compliant with the new system entered into force on the same day, July 26, 2016. Under the new rules, registrants are required to verify the email address that they use to register domains, which means that shortly after registering a new domain, a registrant will receive an email with instructions on how to confirm that the email address and other data provided are valid. The verification must happen within 20 days or the domain name will be deactivated. Under the new rules, email addresses of the registrant and the administrative contact are the required identifying information, which the registrants have to maintain in an active state and keep updated throughout the domain name validity period. Registrants are required to notify their accredited registrars of any changes in contact information. These newly introduced changes also affect domain name transfers and updates. To transfer domain names to another registrar, registrants will need to retrieve an authorization code and complete the transfer through their accredited registrars. The ownership change documents will be generated by the system and automatically sent to the current registrant’s email address. Under the draft law, any natural or legal person can file a written observation, only on absolute grounds, within three months from the trademark application’s publication date. This person does not become party to the proceedings. The IPO must take the written observation into consideration and send it to the applicant, who may then submit a written response within 15 days. According to the draft law, the IPO will conduct formal and substantive examinations on absolute grounds. The substantive examination on relative grounds (earlier rights) will be conducted only if an opposition is filed. Namely, the holder of an earlier trademark or a well-known trademark (regardless of the list of goods/services), the licensee, or the holder of the earlier right to an individual’s name or image, copyright or industrial property right, can file an opposition based on relative grounds for refusal within three months from the application’s publication date. The trademark will not be refused if the holder of the earlier trademark or earlier right explicitly consents to the registration of the later mark. Therefore, the draft law clearly separates the absolute and the relative grounds for refusal. Obtaining trademark registration certificate is optional under the new draft law. The certificate is issued at the request of the trademark holder and upon filing the proof of payment of the prescribed fee. The Law on Amendments to the Law on Legal Protection of Industrial Design, which came into force in Serbia on May 30, 2015, aims to further harmonize Serbian legislation with the EU and bring it in line with Directives 98/71/EC and 2004/48/EC. The Serbian PTO explained that in 2014 it made significant efforts to harmonize its practice with practices of other national offices in the EU, singling out the abolishment of the “class heading covers all” approach as the most significant change. The amendments to the methodology for various proceedings before the Serbian PTO, including this change, came into force on January 1, 2015. Namely, national trademarks will not be registered under the “class heading covers all” approach but under the “means what it says” approach, meaning that the national trademark applicants listing class headings will have coverage only for those goods or services which unambiguously fall under the class headings, whereas some of the general designations under these headings will have to be specified or otherwise refused protection. The PTO has identified 11 general indications of goods/services (in IC 6, 7, 14, 16, 17, 18, 20, 37, 40 and 45) that are not considered sufficiently clear and precise. The new trademark law that entered into force in Montenegro on December 16th, 2010, obligates the owners of trademarks registered before the Serbian Intellectual Property Office to request entrance of their rights into the Montenegrin trademarks register by December 16th, 2011. The obligatory re-registration affects national trademarks registered before the Serbian IPO prior to May 28th, 2008, the opening date of the Montenegrin IPO, unless a renewal or request for recordal of changes or Certificate of Registration had already been filed in Montenegro before December 16th, 2010. The deadline is not extendable. Failure to do so will result in loss of protection of the referenced Serbian national trademark in Montenegro. The Republic of Serbia joined the Nice Agreement concerning the International Classification of Goods and Services for the purposes of the Registration of Marks on September 17th, 2010. The said Agreement will enter into force, will enter into force, with respect to the Republic of Serbia, on December 17th, 2010. A new trademark Law came into force in Serbia on December 24th, 2009. The main innovation of the new Law is the introduction of an Appeal stage in the trademark registration procedure. Namely, according to the previous TM Law, the IPO decisions were final and the only option against decisions of the IPO was to initiate an Administrative Court Procedure before Serbian Supreme Court. It is now possible to file an Appeal before the Government within 15 days as from the date of receipt of the first instance decision. The Ministry of Science and Technological development will probably decide in the second instance. The Serbian Supreme Court still remains the last instance in the IP matters since the Appellants can initiate the Administrative Court Procedure against the second instance decision within 30 days as from the date of receipt. Legal basis is the Serbian Trademark Law in force since December 24, 2009, with the amendments in force as of February 7, 2013. Serbia is a member of the Madrid Agreement and the Madrid Protocol. Trade marks which were protected in former Yugoslavia are also protected in Serbia. Any mark that is used to distinguish goods and/or services in trade and that may be graphically presented, can be protected as a trademark. A mark may be comprised, inter alia, of the following: words, slogans, letters, numbers, images, drawings, combinations of colours, three-dimensional shapes, combinations of such marks, as well as of graphically presentable musical notes. The following marks types are registrable: trade marks, service marks, collective marks and certification trademarks. Trademark applications are filed at the Intellectual Property Office of the Republic of Serbia. If the applicant is a domestic natural or legal person, he does not need an agent. However, foreign applicants with no seat or residence in the Republic of Serbia need a local agent. A non-legalized power of attorney is sufficient. The processing time from first filing until registration or first office action is approx. 6-9 months (smooth procedure provided). Certain applications can be examined in a fast-track procedure, if the statutory requirements for this procedure are met. Upon registration, the trademark is published in the monthly Intellectual Property Gazette “Glasnik intelektualne svojine”. There are no provisions for filing opposition against a pending trademark application. However, it is possible, to file an observation claim against a pending trademark basing such claim on a prior mark that the observant considers similar to the one under examination. This motion only serves to draw the Examiner's attention to the existence of a prior similar mark. The IPO must consider third party observations, however, it is not obliged to inform the party filing the observation about the outcome of the same as the party filing the observation is not a party of the proceedings. The official fee is approx. EUR 127.00 for filing of a word mark in up to three classes and approx. EUR 153.00 for filing of a composite or device mark in up to three classes. The fee for each additional class (after the third class) is EUR 26.00. The prices may of course vary due to currency fluctuations. 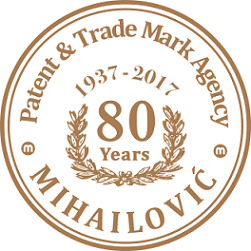 Since 1937, our family run law firm - Patent and Trade Mark Agency Mihailovic, has been providing efficient and high value service to our clients. With headquarters in Belgrade (Republic of Serbia) and offices in Bosnia and Herzegovina, Croatia, Kosovo, Macedonia, Montenegro, Slovenia and Albania, we are a one-stop IP solutions company for the entire region. It is exactly this position that enables us to act on behalf of our clients in the Balkans, but also in the EU. Through our EU based offices, we are able to assist clients in EUTM availability searches, offer support through the EUTM registration process as well as offer guidance when converting EUTM trade marks into national applications in Slovenia and Croatia. Even at 80 years old, we are still passionately dedicated to providing prompt and individual attention to our clients and their needs - from strategic IP consulting, new patent applications or validations, trade mark and design filings, renewals and portfolio management to litigation (which was our primary activity to begin with) and various Customs related matters on behalf of our clients. Learn more on our website or contact us vie e-mail to see how you could benefit from our devoted and efficient approach to IP protection in the Balkans and the EU!